Business phone service for tech companies. Although people who work in tech might think an office phone system is a little old-fashioned, there are a lot of positive benefits to having a business phone service. While cell phones have the advantage of providing a mobile and distributed workforce, using personal phones at work does not give clients a good first impression of your business, and personal phones make it harder for you to network with your co-workers. Why do tech companies need a business phone line? Tech companies still need all of the advanced features they are used to from a normal business line: call park, caller-ID, voicemail, and hold music, to name a few. The tech environment also moves at a fast pace, so the business phone setup needs to be simple, quick and straightforward. Although mobile phones are undoubtedly convenient and used widely by people who work in the tech sector, you are still running a company and need to make business calls from your business line regardless of whether it’s coming from your cell phone or desk phone. Not only is this less confusing for partners, suppliers and clients, but it helps your company appear more professional. See how Ooma helped this company improve their phone experience and support long-term growth. Read about this architectural firm that used Ooma’s business phone service to take their business communications on-the-go with the flexibility to grow. Access your business line from your smartphone: With the Ooma Office Mobile App, you can work remotely or on-the-go and still take calls from your main business line or extension. Easy DIY setup: With Ooma’s do-it-yourself setup, most customers are up and running in minutes. 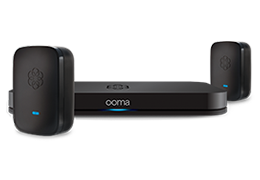 Ooma also offers several wirefree products for a clutter-free office. Virtual receptionist: Create settings for business hours and afterhours, greet clients and partners, and direct calls – this is the best way to help your company look polished, and it helps you stay organized. All-inclusive price: Every Ooma account comes with a local and toll-free number of your choice, a virtual fax extension and a conference extension line. You can choose your own new number, or port an existing business number. Ooma Office can help your tech company stay professional and focused – check out our business phone page to learn more about features and benefits.